The film was released on March 2, 1965 in the United States, initially as a limited roadshow theatrical release. Although critical response to the film was widely mixed, the film was a major commercial success, becoming the number one box office movie after four weeks, and the highest-grossing film of 1965. 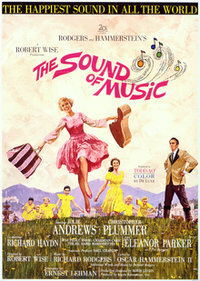 By November 1966, The Sound of Music had become the highest-grossing film of all-time"?surpassing Gone with the Wind"?and held that distinction for five years. The film was just as popular throughout the world, breaking previous box-office records in twenty-nine countries. Following an initial theatrical release that lasted four and a half years, and two successful re-releases, the film sold 283 million admissions worldwide and earned a total worldwide gross of $286,000,000. This webpage uses material from the Wikipedia article "The_Sound_of_Music_%28film%29" and is licensed under the GNU Free Documentation License. Reality TV World is not responsible for any errors or omissions the Wikipedia article may contain.